Contributing dwellings on the 2800 block of Victor Street. 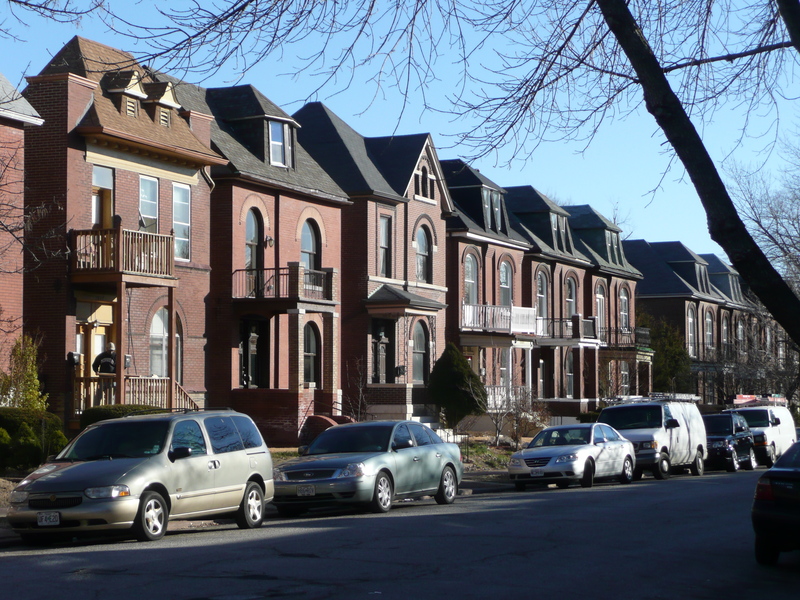 In 2011, the Fox Park neighborhood in south St. Louis extended the reach of its local historic district with a southern boundary increase. The area contained the neighborhood’s trickiest blocks – housing vacancy, large industrial buildings, vacant lots and a massive closed Roman Catholic parish complex were all in the area. DeSales Community Housing Corporation quickly followed the local district increase with funding a National Register district. Without such a step, historic tax credits would not be ready for vacancy-fighting rehabilitation work that DeSales now has underway. PRO went to work on surveying the area and determining a suitable boundary. 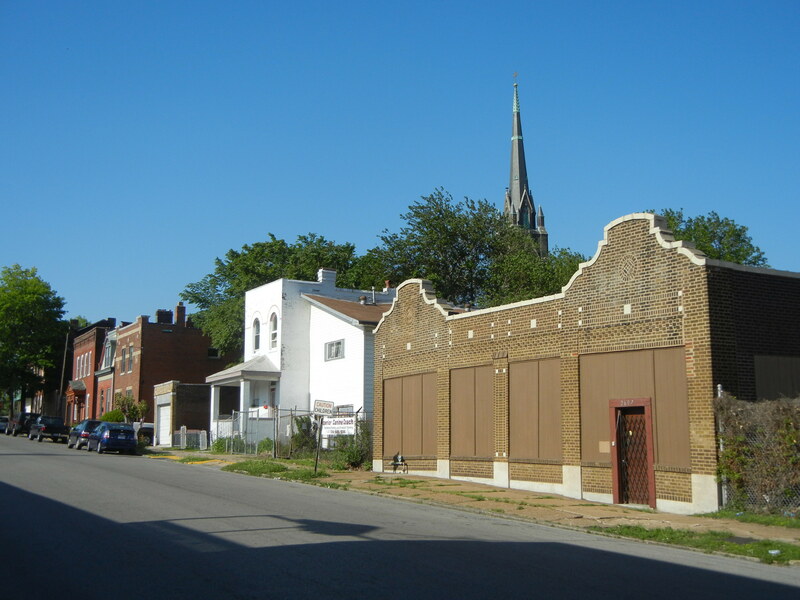 In the end, the St. Francis de Sales Historic District is located on all or part of 18 blocks in south St. Louis. 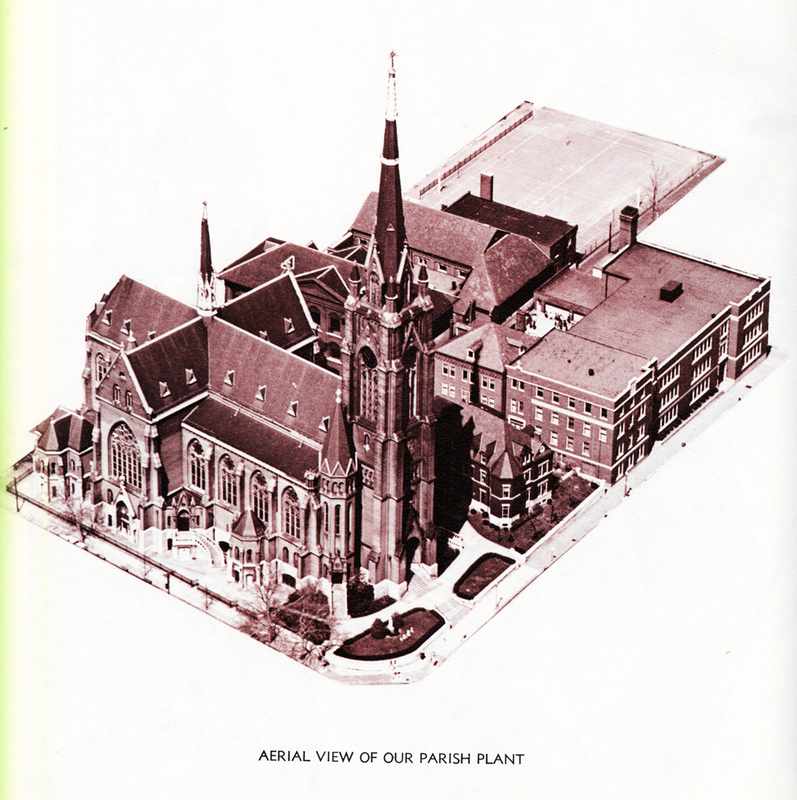 The district’s historic significance, presented in the nomination by architectural historian Lindsey Derrington, hinges on the cultural landscape present between the St. Francis de Sales Roman Catholic Church, first opened in 1867, and the lives of the occupants of district dwellings and workers in district industrial and commercial buildings. Most were parishioners – hence the district name. Stylistically, the range of the District is compact. Besides the Gothic Revival and Classical Revival buildings of the parish complex, nearly all of the buildings are vernacular works that freely mix classical elements with common local building forms, and thus fall within the Late 19th and 20th Century American Movements or Late 19th and Early 20th Century Revival styles categories. Decorative elements define a few residential buildings in the Italianate and Romanesque Revival styles, but few have strong enough associations to be so classified. Architects whose work can be found in the District include several well-known prolific designers working in the city in the 19th and early 20th centuries. These include Henry Hess, Victor Klutho, William A. Lucas, Edward Nolte, Oliver J. Popp, Ernst Preisler, Henry Schaumberg and Joseph Stauder & Son. German dairy farmers began settling the area around Jefferson and Gravois Avenues, a largely rural region characterized by rolling fields and sinkholes, at the close of the Civil War. Located within Sts. Peter and Paul parish boundaries, which then encompassed most of south St. Louis, the community was a full mile and a half to the southwest of the church and far different from the dense working-class Soulard neighborhood which comprised much of its membership. Looking east along Texas Avenue from Sidney Street. De Sales’ presence drew residents as well. The District was part of a larger German community developing in this part of the city. While the vast majority of these residents occupied developing neighborhoods to the east and south, these had grown considerably closer in the years since De Sales’ establishment. The church’s boundaries too encompassed most of the ward, including additional land to the east. The western portion of this area, including most of the land within the District, remained virtually untouched. These circumstances gave German Catholics at the east end of the parish an opportunity to build anew next to their church in an era when ethnic parishes functioned as cultural lynchpins in immigrant communities. Of those buildings from the 1870s and 1880s with confirmed permits, at least six were constructed by life-long De Sales parishioners. These residents were typical of the District’s early growth during which piecemeal development by individuals characterized the era. They also typified an ensuing decades-long trend wherein modest but upwardly mobile residents settled and remained in the District for life. Working- and middle-class families built single- and multi-family homes in the area south of Magnolia Avenues, while dual dwelling/commercial buildings grew along Gravois and Jefferson Avenues. The 1890s ushered in a thirty-year building boom during which the District took on much of its present appearance. Unlike the District’s earlier buildings, many of these were constructed several at a time as speculative measures and were stylistically far more cohesive with uniform setbacks and building heights. A range of working- and middle-class German residents predominated, many of whom had immigrated to St. Louis relatively late in the 1870s and 1880s. Of these, many were St. Francis de Sales parishioners who both constructed buildings in the District and rented there. A 1939 aerial view of the St. Francis de Sales parish complex. Source: Diamond Jubilee, 1867-1942. Eventually, after the 1896 cyclone destroyed the 1868 church building, the parish built the landmark “Cathedral of South St. Louis,” today known as the Oratory of St. Francis de Sales. The 300-foot spire crowns a Gothic Revival church whose origins came from the plans of German architect Engelbert Seibertz, whose St. Paul’s Church in Berlin (1893) inspire the nationalistic parish priest, Peter Lotz. Seibertz produced a design that drew also upon the 14th century church of Frankfurt am Main. Eventually, St. Louis architect Victor Klutho – designer of several other district buildings – took Seibertz’ designs and created the form of the soaring church that was completed in 1907. Later developments in the district brought in larger scale works of industrial architecture, including the plant of the Koken Barbery Supply Company along Sidney Street, as well commercial buildings along Gravois and Jefferson avenues. 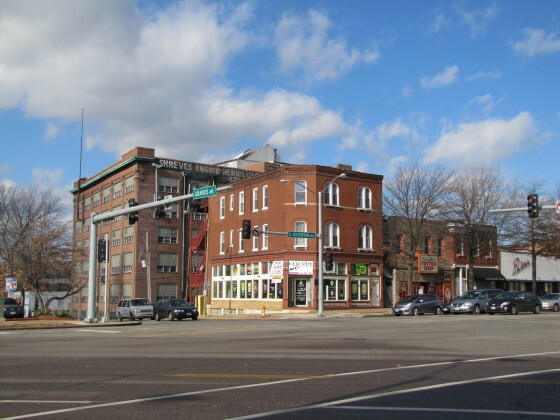 In 1931, Gravois’ widening as part of the implementation of the city’s 1926 transportation plan cleaved the district away from the neighborhoods to the east, and marked the end of the golden era of German-American settlement around the parish. The commercial corner of the district, at the intersection of Jefferson, Gravois and Sidney. This is looking northwest in the intersection. The St. Francis de Sales Historic District demonstrates the important mutual relationship between late 19th and early 20th century urban immigrant neighborhoods and the churches which proved so crucial to their development and identity. The District, still incredibly intact, is evidence of this phenomenon as seen through the lense of St. Louis’ German Catholic community and its struggle for cultural autonomy. Established by the parish in the 1970s to combat blight, the now-independent De Sales Community Housing Corporation is dedicated to stimulating rehabilitation and development within the neighborhood. In keeping with that mission, the non-profit commissioned the St. Francis de Sales Historic District in 2012 to make state and federal historic tax credits available to District residents.